Finally I completed my HGUC Sinanju. Its been a month long project on this guy and luckily I am just in time to meet ZD group build’s deadline 😛 Took the afternoon today after lunch to give this baby a nice little flat top coat. Well enough talking and enjoy the pictures!! 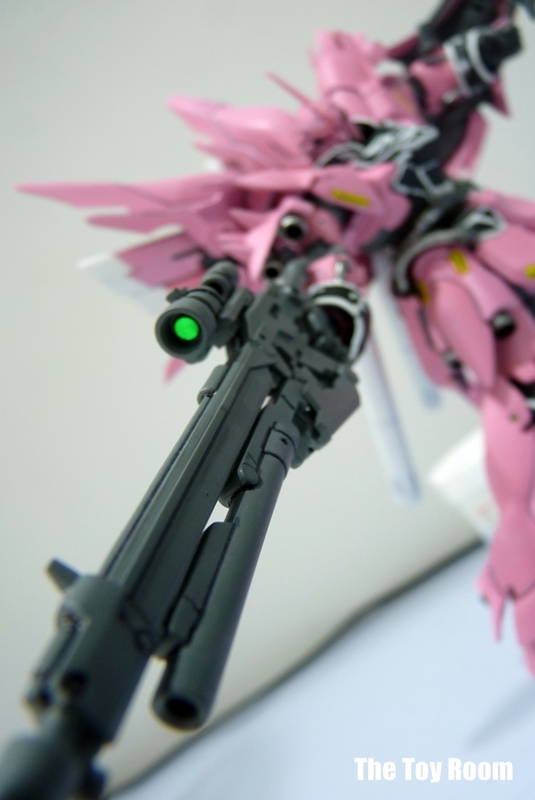 One of Sinanju’s signature weapon is his beam rifle. Remila : Ah so my pink contraption of death is complete!! Oh my…Char will definitely not be in a pink of health when her maids come!!!! I guess its the flat coat and lighting that does the trick! ah What kind of topcoat did you use ? what brand ? 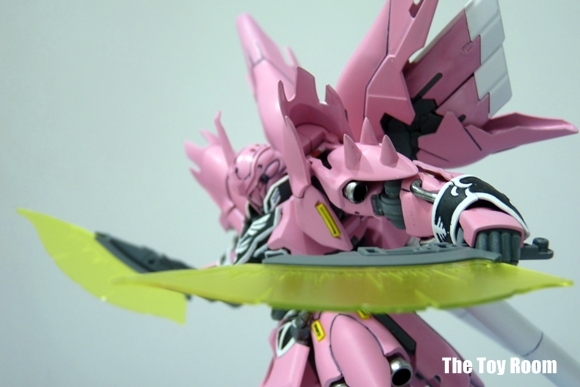 >_< only seen Mr.Hobby brand ,tamiya and some cheap topcoat. what the hell AHAHHAHAHAHAHAHAHHA i didnt see that coming XD dang, Chubbs, you leads the gundam-got-kick C-C-COMBO BREAKER!! Wha haha I was thinking rocklee’s one is cool as hell. My opponent is not even a unicorn haha 😛 Glad you like it man haha! Thanks man! Now I am trying to squeeze out as much as possible first before my son pops out. I’ll probably not be able to build for the next few months!! The pink looks nice and powdery. Can’t believe it’s hand-painted! I think I lost all of my hand-painting skills. 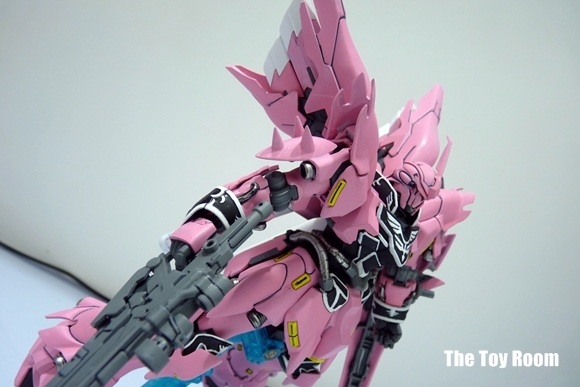 Ah the flat coat kinda gave the pink that powedery look I think. I gave about 2 coats of flat coat for most of the pieces. But your air brushing is so good and so much faster. Handpainting takes a lot of time! 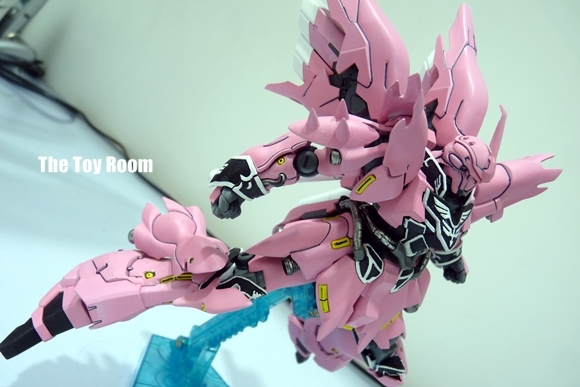 Haha well she had it coming didn’t she…changing such a color for such a reveled mobile suit!! Lol nah…she won’t fly elsewhere for now..especially not out of my house lol!! Oh gosh, you actually did paint it pink. Dunnow what to say… Something so menacing has never looked so cute, I guess? 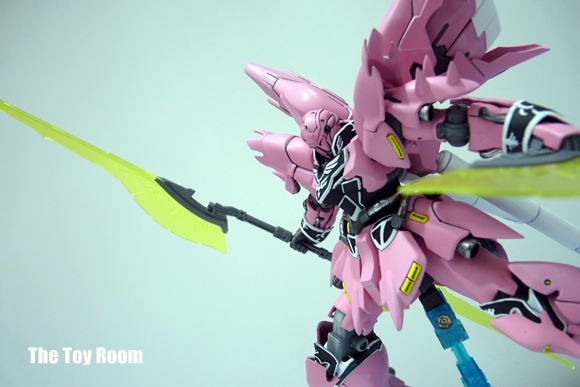 Haha well have a good laugh mate ^^ Nothing gets you in the get better than a pink sinanju owing his opponent ! Ah there is still some time man, I think you should be able to make it!! Lol by all means come man haha! Pink vs…. I think putting on racing decal and it will be complete! LOL Nice paint job tho. Haha great suggestion man! 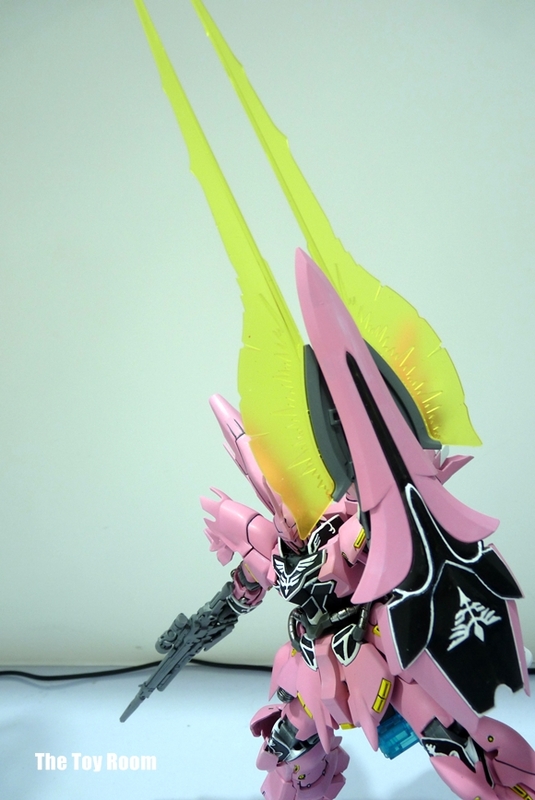 But sadly decaling is not one of my favorite things to do lol….but i definitely need to include that it to make the kit more complete! nicely done.. love the little photoshoot there. Haha thanks bro! Hehe this is one color she won’t be touching for a long long time haha…. Pink= EPIC EBIL, nuff said! Thank you!!! Now I can have marida inside haha..
Ah way to go man! Let me know when your blog is up i’ll link it up! Wow, that pink looks great! 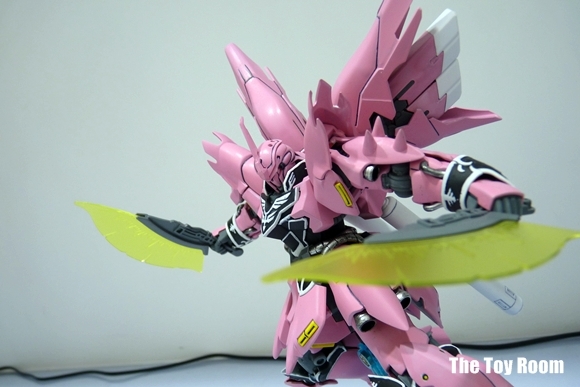 I never knew that Sinanju could look that good in pink! Char must be rolling in his grave…. As for the actual dipping of the brush and how much paint, I think its hard for me to explain here haha…comes with lots of trail and error to get it right I am afraid. Hopefully I can get a vid done or something to show the process in the future. oh and one more question… your omni brush sizes are? 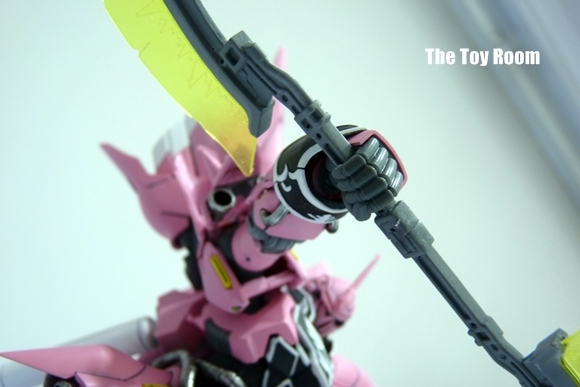 xP..
And how can Char not like pink, when his own Zaku is like 50% pink? Ah I think some spots might not be properly top coated or due to the top lighting 😛 I think probably pure pink isn’t his taste haha. can’t believe it’s hand painted….how did you to that chubbs? the paint looks very good!! Awesome skill you have. Hehe mixture of levelling thinner and constant cleaning of my brushes!! Hopefully I can shed more light in a painting guide later of sorts! Hand painted? that is sick! Haha well technically he is still a form of char of sorts : P Great to hear that dude!! Go for it!! Haha well its from Riannon 😛 Still nothing beat Nagi Surprised face…..
Glad you like the color scheme man, I was very afraid it might turn out too feminine or weird for taste! Haha one thing I like about hand painting…I save tons of cash on supplies 😛 Hehe going full speed!!! Buahaha yo man, when ya going to do gunpla, its been a while since I last saw gunpla stuff from you haha 😛 Anyway thanks!! So can give this to me as souvenir or not? I really love baby pink!!!! Wow, that pink is very bold. I’ll probably keep mine red, but you did a very good job. 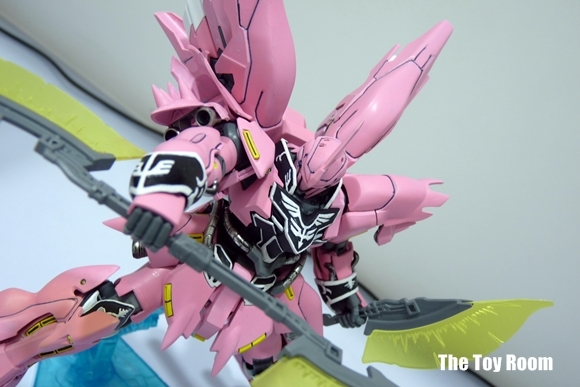 My first encounter with pink Sinanju. Nice job bro and I like the posing and photo shot. Thanks man!! Glad you like the color and shots! ohohoh! YES!! 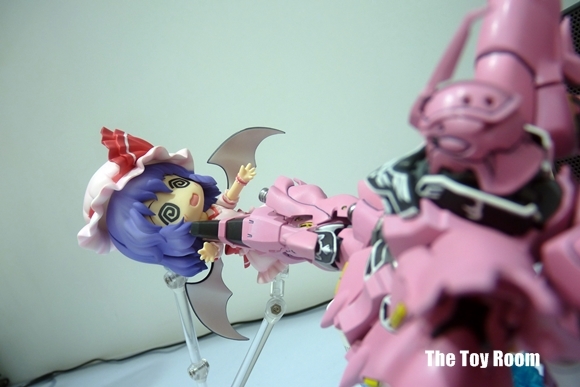 finally remilia’s SHE-nanju is complete! the blend of pink/black/white/yellow looked out great! 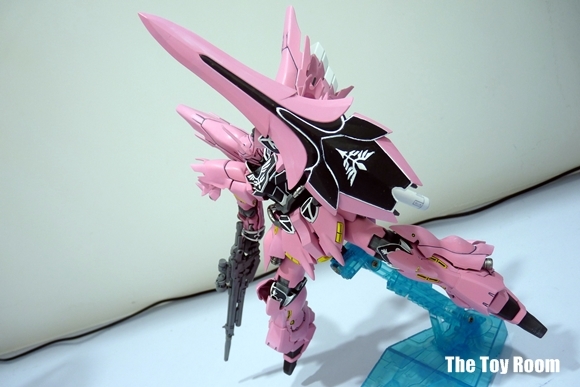 better find him another sinanju to pilot because that one is specially made for the scarlet devil. HAha Scarlet Devil She nanju custom 😛 Thanks for the kinds words man!!! Glad you like the build haha!! Also I think Remila will be plotting something with Sakuya hehe…..stay tuned!! Revenge can be sweet! 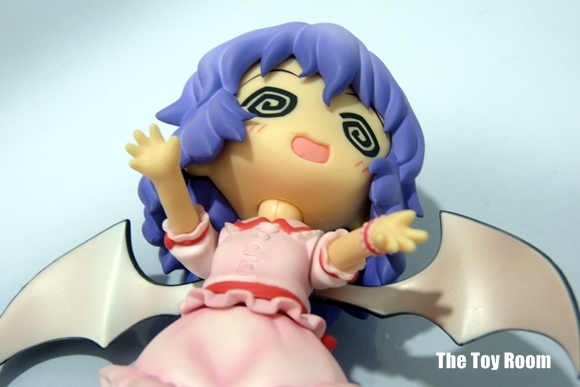 I see you’ve been enjoying that Touhou Project game I’ve given you..
@Erazer: hahaha! yep. thanks to you, (downloading and playing two or three games) i have sufficient knowledge about it and some of it’s characters. you should try it once! I’ve been a lurker in your site for some time now. 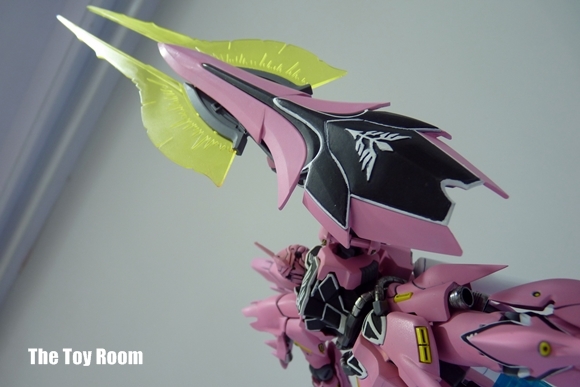 Couldn’t resist to say I’m really impressed with this Sinanju! Just can’t believe it’s handpainted! Also, I would like to say I’m in the queue of people anxious to see a tutorial! Wow you made my day man! Thanks for the kind words! Hope I don’t disappoint with the tutorial!! I’ll do my best! whoa heh! 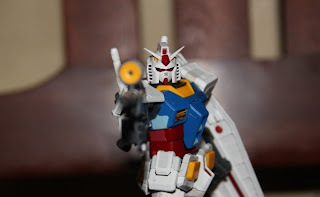 Well come back gunstray! Don’t really know about the point of thid “Pink Comet” color scheme, it surprises Me like a zombie surprises someone in a horror movie. But the pink along with the white lines kinda fit together like a palette swap to the red and gold lines. Interesting analogy lol. I initially thought of using gold but find that it doesn’t fit as well as white. 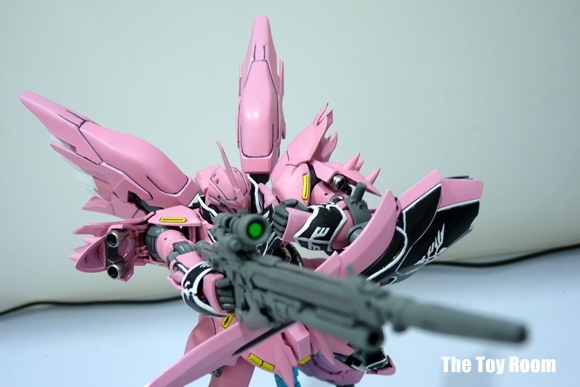 This is similar to the geara zulu just that its slightly more pinkish haha. Handpainted? Super cool! I think I’m liking the pink color too. Haha yep ^^ handpainted! Thanks for the like!! 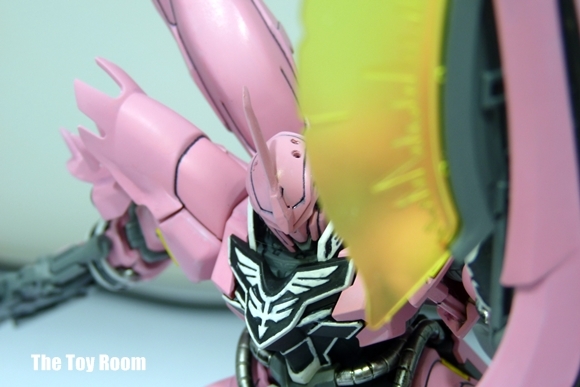 Actually, Sinanju’s pilot is not Char. It’s a Cyber Newtype (a basis of the Innovades from Gundam 00) who contains Char’s memories and undergoes complete physical (and genetically) reconstruction to look, sound and have feelings exactly like Char, his name is Full Frontal which means ‘stark naked’ (WTF :O). 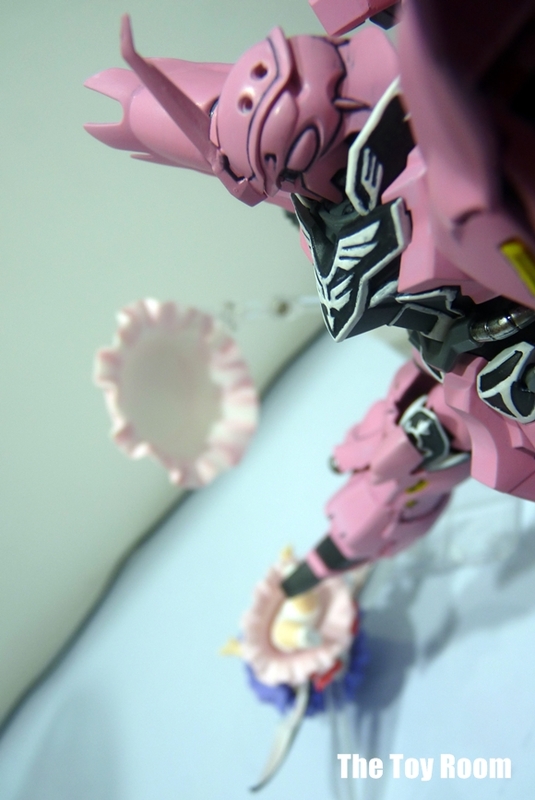 Sinanju is pinky and…… cute, I wonder how will Banagher react when he see it hehehe. How did you paint the trim? Seriously,mines looking like a mess. Hi Evilwarrior, sorry for the late replies, been busy lately ^^. 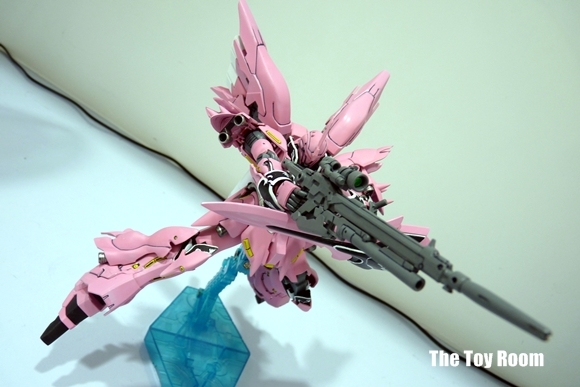 To answer your question, I did it here for my Kshatriya. and the pose with raiser sword, I like it! Thanks for the compliments! Sure no prob! I’ll add you to mine as well! @ Janus Lu hehe thanks for the kind words bro! !